Sometimes new-home shopping takes one to all corners of the Las Vegas Valley to find the “perfect home.” For Michelle Walter, she found her ideal home at a CalAtlantic Homes neighborhood in Henderson, but she decided to look for a home closer to her work in the southwestern valley. 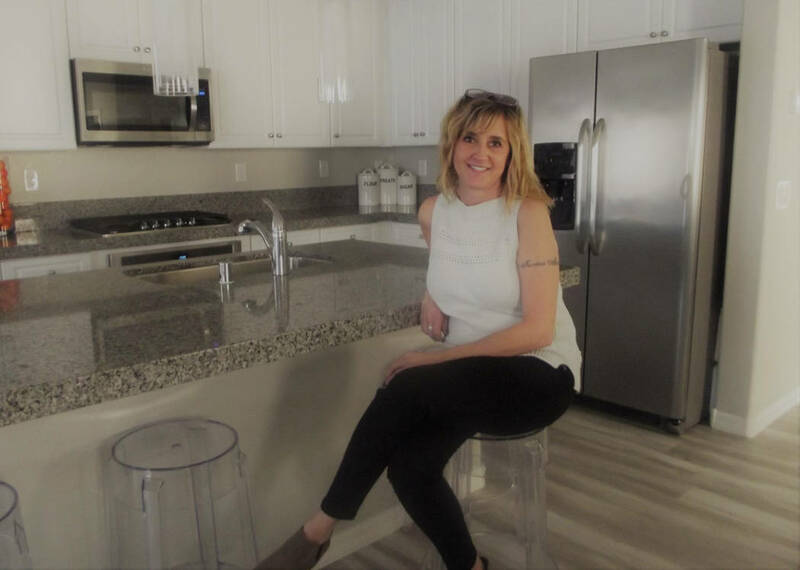 Sometimes new-home shopping takes one to all corners of the Las Vegas Valley to find the “perfect home.” Michelle Walter found her ideal home at a CalAtlantic Homes neighborhood in Henderson, but she decided to look for a home closer to her work in the southwestern valley. “After telling the builder’s sales agent that we would need to sell my town home before buying the new home, the sale agent encouraged me to contact the Nevada Builder Trade In Program that helps people buy a home on contingency,” Walter said. Upon learning more about the program, which is operated in Southern Nevada by Robin and Robert Smith of the Smith Team at Keller Williams Las Vegas, she decided it may fit her needs. “I met them when they came over to look at my town home, and I got a feel for Robin (Smith), her team and the program. I liked the program and its clear process of how to buy a new home on contingency,” Walter said. Like they do for their hundreds of other clients, the Smith Team provided Walter a complimentary market analysis that provided her a projected sales price for her town home based on the market, and with this information in hand Walter could decide if purchasing the brand-new home made financial sense. After she decided to move forward with the Nevada Builder Trade In Program, the Smith Team listed, marketed and sold Walter’s town home at a reduced commission and offered the buyers’ agent the standard 3 percent commission. Walter’s home sold super fast with a bidding war. “We sold the home surprisingly fast, just three days after it was listed. We had 17 offers on the first day that it was listed, and those 17 offers caused a bidding war. It ended up selling for $20,000 more than I initially wanted with the help of my agent, Saundra Ware,” Walter said. The summer 2017 sale allowed Walter to move forward with the purchase of a two-story, 2,000-square-foot home under construction. The construction timeline, however, led Walter to relying on the Smith Team to negotiate a lease-back of her town home for several months until her new home closed in December 2017 and her January 2018 move-in. Walter selected a three-bedroom, 2½-bath home located along a cul-de-sac that had fallen out of contract with another buyer, and she received several financial incentives in this choice. When she first saw her home under construction, its concrete slab had already been poured, and options were selected like its 9-foot ceilings and kitchen with upgraded white cabinets and stainless-steel appliances. To personalize it, she opted to lay her own flooring after closing with a light gray-cream laminate wood that she had seen elsewhere. Its design with two living room areas — one on the first floor and the other on the second floor — makes it ideal for her and her college student daughter as it allows each a separate living space. “Everything worked out great — my town home sale, the purchase of my new home and the first few months of living here,” Walter said. The Nevada Builder Trade In Program is available at more than 50 neighborhoods constructed by builder-partners Beazer Homes, CalAtlantic Homes, Century Communities, Pulte Homes and Woodside Homes, as well as Sun City Mesquite by Del Webb. Some neighborhoods sell standing inventory homes on contingency as well. Homeowners interested in the program can gain additional information by contacting the Smith Team at 702-460-5080, visiting ISellLasVegas.com or inquiring at a builder partner neighborhood. Those interested in purchasing a home on contingency at a non-builder-partner neighborhood and receive benefits similar to the Nevada Builder Trade In Program should contact the Smith Team before beginning their home search.